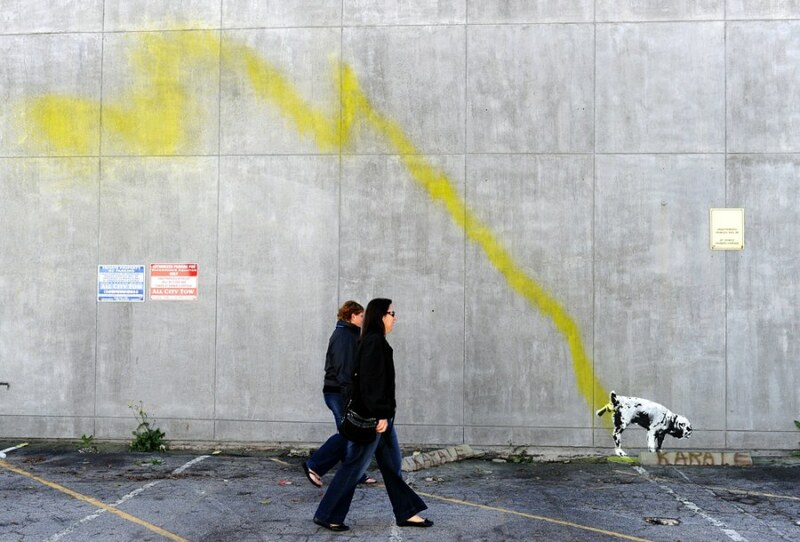 A graffiti attributed to secretive British artist Banksy shows a dog urinating on a wall in Beverly Hills, California on February 17, 2011. Another graffiti was ripped down Wednesday in Hollywood, amid sightings of other pieces in a reported pre-Oscars publicity stunts. Banksy is nominated for best documentary for "Exit Through the Gift Shop" at the Oscars, due to be announced on Feb. 27 at the climax of Tinseltown's annual awards season. An artwork painted on a billboard is seen in Los Angeles on Feb. 16, 2011. Street artist Banksy's first film "Exit Through the Gift Shop" is up for an Oscar -- and it seems the subversive Briton may be waging an unorthodox award campaign on the walls and billboards of Los Angeles. 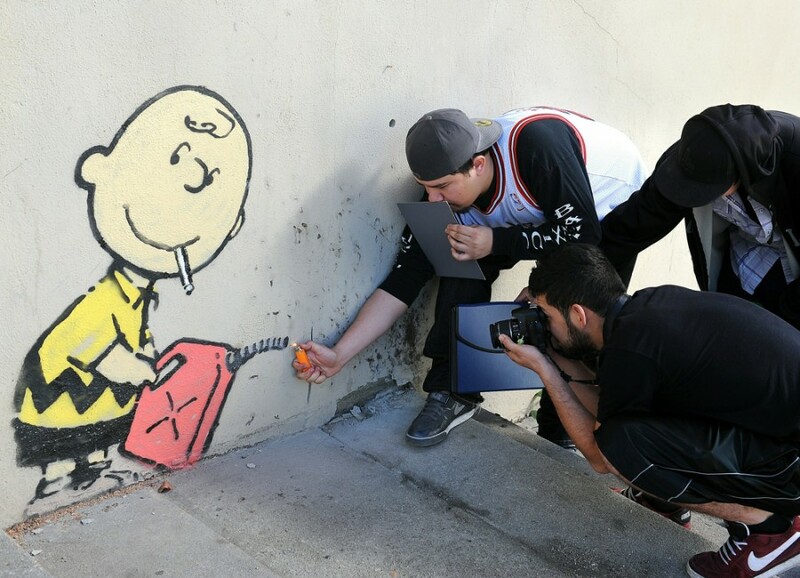 Several examples of graffiti bearing the hallmarks of Banksy's style and humor have turned up in areas of the city in recent days, including a Charlie Brown figure apparently bent on arson, and a cocktail-swigging Mickey Mouse. A graffiti attributed to secretive British artist Banksy depicting Charlie Brown figure starting a fire on the side of a burned-out building on Sunset Boulevard in Los Angeles, California on Feb.17. Another graffiti was ripped down in Hollywood, amid sightings of other pieces in a reported pre-Oscars publicity stunt in LA. Banksy is nominated for best documentary for "Exit Through the Gift Shop" at the Oscars, due to be announced on Feb.27 at the climax of Tinseltown's annual awards season. 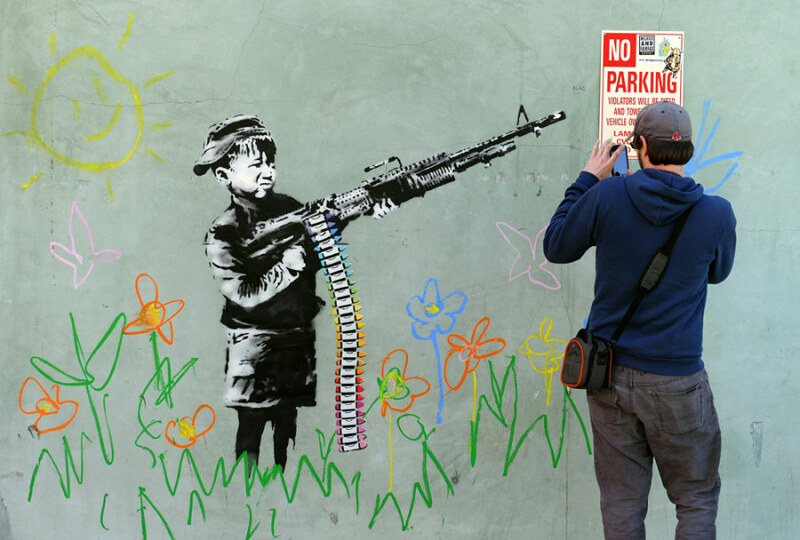 A graffiti attributed to secretive British artist Banksy depicting a child wielding a machine gun, in black and white surrounded by colored flowers, is spotted in Westwood, California on Feb. 17, 2011. Another graffiti was ripped down Wednesday, Feb.16th in Hollywood, amid sightings of other pieces in a reported pre-Oscars publicity stunt. Banksy is nominated for best documentary for "Exit Through the Gift Shop" at the Oscars, due to be announced on February 27th at the climax of Tinseltown's annual awards season. Graffiti credited to secretive British artist Banksy has been appearing in Los Angeles over the past few days. The artist is nominated for best documentary for "Exit Through the Gift Shop" at the Oscars. I wonder if he will show his face to accept the award.